John Gotjen of Chocorua, New Hampshire, took some time during the 2015 Christmas Holiday season to build this 6′ lapstrake skiff for his friend Frosty. 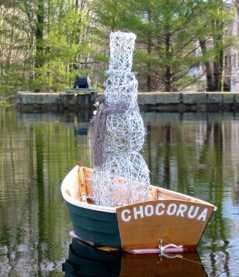 CHOCORUA is built from 5/16″ underlayment plywood and luan plywood transom, and some leftover tubes of adhesive caulk. It floats on 2″ rigid foam and has no bottom planking, so John doesn't have to bail it. 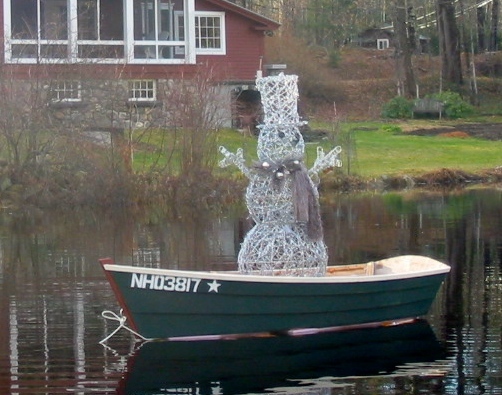 Frosty has captained CHOCORUA around the town’s millpond for several weeks now, without incident, though its lights fail to meet marine regulations. Come the next ice out, he’ll be headed back to the barn for the off-season, perhaps to return with the cold next year.